A thermostat, in the most simple terms, turns on the furnace or air conditioning system until the room temperature reaches the set temperature. Then, the thermostat turns the system off. Can a programmable thermostat be used to replace an existing conventional thermostat? Yes, LUX programmable thermostats can be used to replace most conventional low voltage and millivolt thermostats. The same wires used for installation of conventional mechanical thermostats are used for installation of programmable electronic thermostats. Can programmable thermostats really save energy? Yes, programmable thermostats can save energy and save you money on utility bills. According to the U.S. Department of Energy, a programmable thermostat can reduce heating costs by up to 35% and cooling costs by up to 25%. Your savings will largely depend on the length of your energy saving program periods and the temperatures set. For example, an energy saving period of 10 hours with the temperature set back 10° will save more than a 5 hour energy saving period with the temperature set back 5°. Of course I want to save money on my utility bills, but I don’t know anything about programming. Don’t worry, almost all LUX programmable thermostats are pre-programmed with a typical energy-saving schedule, with separate programs built-in for Heat and Cool. I work at night and I am home during the day. Can I easily make changes in a LUX pre-programmed thermostat to fit my schedule? Yes! You can change any of the preset times and/or temperatures to suit your schedule. Many of our thermostats have easy instructions inside the door that explain how to select the program period you want to adjust. Is there someone I can talk to if I have a question about the installation or operation of my LUX thermostat? Yes, LUX has a staff of trained technicians to help you with any questions you may have. The technical assistance telephone number is (856) 234-8803. How do I know if I have a system or C-wire? The wires coming out of the wall will attach to a “lettered” terminal on the base of your thermostat. The system common terminal is labeled “C”; if you have a wire connected to this terminal, you are system powered. What can I do if I don’t have a system common “C” wire? Your local heating/cooling (HVAC) professional can install a “C” wire for your existing thermostat. Alternatively, you can use the LUX Power Bridge or the LUX USB power adapter kit. Will using Alexa voice commands through the LUX Products Skill interfere with my LUX mobile app? 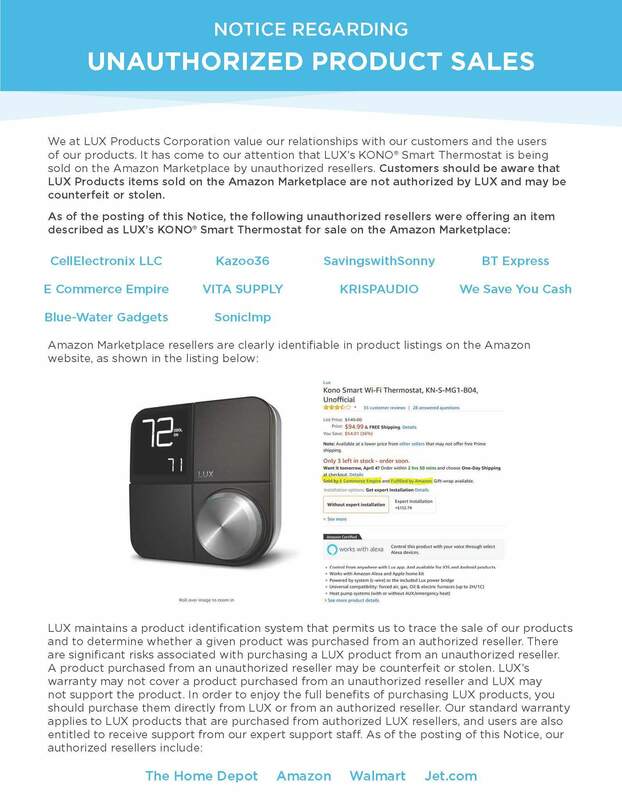 Changes requested through Alexa voice commands will be visible on the thermostat display screen, the mobile app, and in the my.luxproducts.com web portal. If that doesn’t work, confirm that your thermostat is connected to your router. If your thermostat is connected to your WiFi router, you’ll see a WiFi icon on the upper right hand corner of the screen. If not, your thermostat is not connected to your router, and you should continue with the suggestions below until your thermostat is connected to your router again. Try resetting your thermostat. Remove the thermostat from the wall and press the RESET button on the back. Once pressed, replace the thermostat on the wall. Once the thermostat is connected to your router, it will display a WiFi icon on the upper right hand corner of the thermostat’s screen. For Heat Pump systems, ensure that the thermostat is configured for the Heat Pump system type. If you want to cool your home, make sure that your thermostat is in Cool or Auto mode and that your target temperature is below the ambient temperature shown on the thermostat. If you want to heat your home, make sure that your thermostat is in Heat or Auto mode and that your target temperature is above the ambient temperature shown on the thermostat. If the thermostat was just installed, review the wiring connections that were made for any errors. Make sure you were using the correct wiring diagram for your specific heating/cooling system type. Can you help me connect my thermostat wires or Power Bridge? Contact our Technical Assistance Line or your HVAC service company. Please make sure that you are prepared to provide us with the exact terminal letters and wire colors from your previous thermostat. NOTE: any wires that were not used on your previous thermostat will not be used on the new thermostat. The wires coming out of the wall will attach to lettered terminals on the base of your thermostat. The system common terminal is labeled “C”; if you have a wire connected to this terminal, then you are system powered and can proceed with a typical c-wire installation. What can I do if I don’t have a C-wire? Use the LUX Power Bridge, included in the package with KONO thermostats. Please refer to the “Installing without a c-wire” section in the KONO Installation Manual, or visit this link to view the manual online. Alternatively, your local heating/cooling (HVAC) professional can install a C-wire for your thermostat. Why should I set a heating and cooling schedule? Setting a schedule saves you money and energy. Many people don’t set heating and cooling schedules because their thermostats are just too difficult to operate. Using the LUX App to control your thermostat offers an intuitive interface that makes setting your schedule a breeze. What is the set temperature? The set temperature is the temperature your thermostat will keep your home at or near. If your home is in cooling mode, your cooling system will turn on if the temperature in your home rises above the set point. If your home is in heating mode, your heating system will turn on if the temperature in your home falls below the set point. What’s the difference between the Heat, Cool, Auto, and Off modes? If your thermostat is in Cool mode, your cooling system will turn on if the temperature in your home rises above the set point. Cool mode is best for the summer months, when there’s no chance you’ll want your heat system activated. To protect your cooling equipment from possible damage, do not use Cool mode when the outdoor temperature is below 50°F/10°C. If your thermostat is in Heat mode, your heating system will turn on if the temperature in your home falls below the set point. Heat mode is best for the winter months, when there’s no chance you’ll want your cool system activated. If your thermostat is in Auto mode, heating or cooling modes will be automatically activated within the range of your heating and cooling schedules. To protect your cooling equipment from possible damage, do not use Auto mode when the outdoor temperature is below 50°F/10°C. If your thermostat is in Off mode, you are not using your HVAC system to control your home’s temperature. The Hold button maintains your home at its current target temperature even if a schedule change should occur. It’s there in case you want to change your usual routine – like if you’re throwing a party and don’t want your home to shift into its overnight temperature setting. Make sure that you don’t just set your thermostat to Hold and leave it there – you’ll miss out on the savings and efficiency that only a schedule can provide. I put my thermostat in Auto mode. Why can’t I change the Set Temperature? If your thermostat is in Auto mode, Heat or Cool modes will be automatically activated within the range of your heating and cooling schedules. You may notice that on the website and mobile apps you can’t make any temporary changes to the current Set Temperature. Additionally, you won’t see the current Set Temperatures for Heating and Cooling. How can I change units from Fahrenheit to Celsius? The units used on the web and mobile applications can be changed by logging into the web app and editing your profile. On the profile page you can change your Temperature Preference. This change will be applied to the web and mobile apps. To change the preference on KONO, please refer to the Installer Settings Guide. I forgot the password used for my LUX account. How do I recover it? Visit the Reset Password page. We’ll email you a special link that will allow you to change your password. The link is only valid for 24 hours. How do I move a thermostat to a different user’s account? How do I change the email address associated with my Lux account? Sign In to your Lux account with your current email using a web browser. Once Signed In to your account, click on your name in the top right corner of the screen and select “Account Info.” Here you will be able to change the email address associated with your account. NOTE: You will only be able to set your email address to one that has never been used to create a Lux account. If you are looking to move your thermostats to another Lux account, please see the question above about moving thermostats. Starting on the thermostats page, select “Manage location(s)…” from the location drop down to access the Locations page. There you can delete thermostat from your account. You can share thermostat control with friends and family without sharing your password. Go to the Locations tab on your Profile. Select the “share location” link for the location you want to share. Now just enter the other person’s email address, and they’ll get an invitation to share access to the thermostats in that location. Will I get a notification if my thermostat drops offline? Yes, you’ll get an automatic email notification when your thermostat has been offline for 24 hours without connecting. You can change your notification preferences for a thermostat on the Settings tab of the Thermostat page. Yes, we have mobile apps available for iOS (iPhone, iPad, iPod touch) and Android. Both apps allow you to manage your thermostat when you’re on the go. I’m moving to a new home. Will I need to repeat the process of connecting my thermostat to the Internet using my account? Maybe. If you use the same wireless router and network name, your thermostat should reconnect automatically in your new location. Otherwise, you must reconnect your thermostat to the Internet using the setup process. Don’t forget to update your Profile with your new location’s information. Different systems require different setup options. When the thermostat’s SYSTEM TYPE settings are adjusted properly, this sends the appropriate fan signals for applications that require the thermostat to trigger the blower fan during heating (as opposed to the system handling this task). Check that the Fan mode is set to AUTO, instead of ON. If the blower fan continues to run after removing the front half from the wall plate (for at least 5 minutes after removal), this would indicate that there is a fault in the HVAC system, not the thermostat. Consult your local HVAC technician for service. It’s very easy for the heat from your hands to impact the thermostat’s temperature when you are holding it. If you are comparing this to a separate, calibrated temperature sensor or thermometer, please set it down directly next to the thermostat for at least 15 minutes to ensure they both adjust to the ambient air around them. If it is necessary to make a change to the thermostat’s displayed temperature, use the Calibration feature in the system settings. By calibrating, you can manually adjust the thermostat’s temperature measurement, up to plus 5°F (3°C) or minus 5°F (3°C) degrees from the displayed room temperature. First, check that the thermostat’s OFFSET setting is not set to 0 (zero). This needs to be set to at least 1 or higher for the 2nd stage of heating to work. If this doesn’t resolve the issue, confirm that the Aux heating wire is attached to the thermostat’s “W2” wire terminal. On the thermostat connected to your heat pump, confirm that the Aux heating wire is attached to the “W2” wire terminal. The “W2” terminal is used for both Aux heat and also Emergency Heat. Remove the thermostat body from the wall plate. Check to see if the heating or cooling output turns off within the next few minutes. If it does not, these components can be turned off at the circuit breaker panel. Note that if you are trying to use your cooling system, the thermostat may not activate a cooling stage until its compressor protection time has elapsed (this may be a long as 5 minutes). Fill the hole behind your thermostat that contains its wires with non-combustible insulation or putty to prevent any drafts. Drafts from this hole can impact the thermostat’s room temperature measurement accuracy. Yes, just contact our Technical Assistance Line or your HVAC service company. Please make sure that you are prepared to provide us with the exact terminal letters and wire colors from your previous thermostat. NOTE: any wires that were not used on your previous thermostat will not be used on the new thermostat. Your first option is to use the LUX Power Bridge, included in the package with KONO thermostats or sold separately for GEO family thermostats. Please refer to the “Installing without a c-wire” section in the KONO Installation Manual, or visit this link to view the Power Bridge manual online. The units used on the web and mobile applications can be changed by logging into the web app and editing your profile. On the profile page you can change your Temperature Preference. This change will be applied to the web and mobile apps. To change the preference for a thermostat, please refer to its Operations Manual. How do I set my thermostat to act as a manual thermostat? How do I remove the programming? In most programmable thermostats, there is a setting for “Hold Temperature”. This will maintain a single set temperature, and not follow a scheduled program. You can find more information about setting holds in your thermostat’s Operations Manual. Connect one wire to W1 and the other to RH. If there are only these two wires present and cooling is not used with this thermostat, the order of the wires will not matter (i.e. they can be reversed and the heat will still work). Connect one wire to RC and the other to Y1. If there are only these two wires present and heating is not used with this thermostat, the order of the wires will not matter (i.e. they can be reversed and the cooling will still work). There are currently no LUX thermostats that are compatible with these kinds of systems. The R, RH, or RC wire is the 24-volt transformer wire. Connect this to RH. Leave the jumper connecting RH to RC (in some thermostats, this option will be a wire jumper across the terminal connections, while in other thermostats this will be a RH-RC shorting cap on the circuit board). Connect the forced air heat system wire to W1, and the fan wire to G.
This system has what is referred to as a 3 wire zone valve. Connect the 24-volt power wire (usually R or RH) to the RH connection. Leave the jumper connecting RH to RC (in some thermostats, this option will be a wire jumper across the terminal connections, while in other thermostats this will be a RH-RC shorting cap on the circuit board). Attach the “valve close” wire to the A terminal and the “valve open” wire to the W1 terminal. The A terminal is powered at all times when heating is not being called for. Connect the 24-volt power wire to RH. Leave the jumper connecting RH to RC (in some thermostats, this option will be a wire jumper across the terminal connections, while in other thermostats this will be a RH-RC shorting cap on the circuit board). Connect the heat wire to W1, and the cooling wire to Y or Y1. Connect the 24-volt power wire to RC. Leave the jumper connecting RH to RC (in some thermostats, this option will be a wire jumper across the terminal connections, while in other thermostats this will be a RH-RC shorting cap on the circuit board). Connect the cooling wire to Y or Y1 and the fan wire to G.
Connect the 24 VAC transformer wire to RH or RC. Leave the jumper connecting RH to RC (in some thermostats, this option will be a wire jumper across the terminal connections, while in other thermostats this will be a RH-RC shorting cap on the circuit board). Connect the heat wire to W1, the cooling wire to Y or Y1, and the fan wire to G.
Connect the reversing valve wire to B or O, just as the previous thermostat. Do NOT connect wires to both B and O; if you had both on your old thermostat O goes to O, but your B wire will go to our C terminal). Leave the jumper connecting RH to RC (in some thermostats, this option will be a wire jumper across the terminal connections, while in other thermostats this will be a RH-RC shorting cap on the circuit board). Install a jumper connecting Y or Y1 to the W1 terminal (there will NOT be a wire from your system connecting to our W1 terminal). Connect the compressor wire to Y1 and the fan wire to G.
Connect the reversing valve wire to B or O, just as the previous thermostat. Do NOT connect wires to both B and O; if you had both on your old thermostat O goes to O, but your B wire will go to our C terminal). Leave the jumper connecting RH to RC (in some thermostats, this option will be a wire jumper across the terminal connections, while in other thermostats this will be a RH-RC shorting cap on the circuit board). Install a jumper connecting Y or Y1 to the W1 terminal (there will NOT be a wire from your system connecting to our W1 terminal). Connect the compressor wire to Y1 and the fan wire to G. If you had a wire labeled X this can go to our C terminal. If you had either an E or X2 wire for Emergency Heat, attaching this wire is typically not necessary because we signal Emergency Heat from the W2 wire. Connect your W2 (or W) wire to the W2 terminal. If you have a C (common wire) connect it to the C terminal. How do I connect my LUX thermostat with a Google Assistant enabled device? First, make sure that your thermostat is installed and can be controlled by the LUX App. To connect your thermostat with Google Home, please visit this article for detailed instructions. To connect your thermostat with an Android device using the Google Assistant, please visit this article for detailed instructions. To connect your thermostat with an iOS device using the Google Assistant, please visit this article for detailed instructions. Which commands can I use to control my LUX Thermostat with the Google Assistant? Set the (thermostat name) thermostat to 72. Raise the temp by 4 degrees. For a full list of supported commands, visit Step 5 of this article. How do I connect my LUX thermostat with an Amazon Alexa enabled device? First, make sure that your thermostat is installed and can be controlled by the LUX App. Next, go to the Amazon Alexa mobile App. In the Skills section of the main menu, search for LUX Products and click enable to complete the connection. Which commands can I use to control my thermostat with Alexa? What’s the temperature in (thermostat name)? Set the (thermostat name) temperature to 72 degrees. Increase the (thermostat name) by 4 degrees. How do I connect my LUX KONO with an Apple HomeKit enabled device? If you install your KONO thermostat with an iOS device, it will automatically add your thermostat as an accessory in your ‘default’ Home location. If you want to move the thermostat to a different Home location, delete the thermostat in the Home App, select the new Home location, then re-connect the thermostat using the Home App. To re-connect the thermostat using the Home App, use KONO’s control knob to select the WIFI icon, then select “SET”. When the thermostat displays “01” in the top left corner and “iOS” in the bottom right corner, press the knob. Once the thermostat says “03” in the top left corner, return to the Home App and select “Add accessory”. which commands can I use to control my LUX thermostat with HomeKit? What is my home’s temperature? What is my thermostat’s temperature? Set my thermostat to 72 degrees. Increase my thermostat temperature by 4 degrees. Set my thermostat to heating. Should I use scheduling in my LUX App in addition to the Automations in the Home App? No. We recommend using either scheduling in the LUX App or Automations in the Apple Home App, but not both. If you want to use Automations in the Apple Home App, set your LUX thermostat to ‘Hold – On’ in your LUX App. Can I use the Home App or Siri to control my thermostat when I am away from home? Yes, but you will need to have certain Apple devices installed and consistently powered in your home. Please visit this article for more details.